Leftovers in our kitchen are recycled and reloaded regularly, so for this month’s Lasang Pinoy theme hosted by Mike of Lafang, we only had to stretch as far as the refrigerator for inspiration. I like to call these moments my Iron Chef events. I start pulling things from the refrigerator, lay them on the table and try to come up with a dish that will give leftovers a makeover. One of the shortcuts I make with ground beef, especially with the large packs bought from Costco, is to pre-saute the pack (with onions, garlic & seasonings), divide it into portions and freeze some for later use. We had just used up some pre-sauteed ground beef to make some enchiladas, but had a handfull left. I put them aside to use for something else like a fritata, but when I saw this large bitter melon hanging on the vine, I thought I would try stuffing it with some ground beef instead. 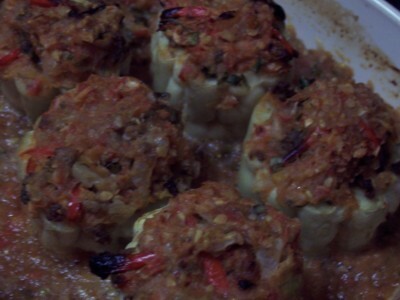 We also still had some tomatoes, the last from the garden, so I decided to cook the stuffed ampalaya in tomato sauce. Cut the bitter melon into 1.5 inch lengths and remove seeds. Lay ‘tubes’ in an oven safe dish and fill the centers with the cooked ground beef mixture. Pour the tomato mixture around and over the stuffed bitter melon. I had some leftover strips of sweet pepper from a pizza bake the night before, so I layed some of those on top of the stuffed bitter melon too. Place the dish in a oven pre-heated to 350 degrees F and bake for 30 to 40 minutes until the bitter melon is tender. pinoys are really tops not only in recycling but in budgeting too, or in this case, planning! i love ampalaya and will definitely try this one soon. thanks for joining lasang pinoy 15 and hope to see you again in all the future events! Hi Karen, that photo looks delicious!! This stuffed bitter melon is usually fried too, but I was trying to find a less fattening way to do it. I think this worked out pretty well. Hi Lani, yeah, I was wondering too if it would work out baked, and it did! I’ve only had the fried stuffed ampalaya before too and I thought I would find a new way to do it. 🙂 It’s good with the tomato sauce! Uyy, I usually fry my stuffed ampalaya. Well, pwede pala i-bake, mas ok ito. Thanks. well damn. definitely iron chef worthy. 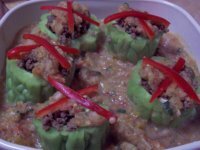 I’ve never thought of stuffed ampalaya. Sounds delicious with ground beef. Shame i can’t get big ampalaya. Sigh.